An American woman, who was left school with no qualification joined an online tutoring company to study English – chooses online tutoring over traditional tutoring to allow her flexibility. Single mother of two, Jennifer Preston is learning maths, English and sciences from Vipin with the view to go onto a degree coarse to Study English literature. “Having a flexible online tutor in the US is giving me an edge as I can look after my children” says Jennifer. She left a job as a diner assistant and has been using these services for 3 months. Jennifer feels, “I am being led by the smartest brains. My online tutor in America works alongside me helping me understand ideas and concepts. 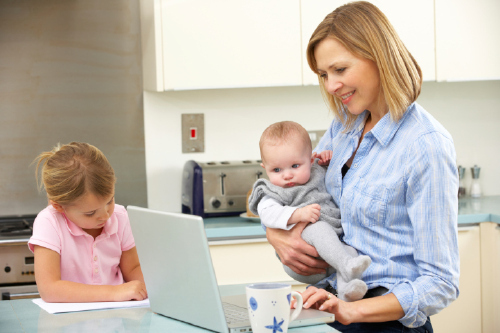 Online tutoring from the USA means that she can also look after her children at home. Jenifer Devon says studying from home allows her to look after her children, and gives her the freedom to choose what time she wants to take classes. But it also gives her an adequate flexible. She says she would have found it difficult to manage learning and family life if she had to travel. Joanna Leytone says, “online tutoring for USA students is cost effective because for home tuition the teachers expected salary is not affordable”. An hour-long session may cost a student anywhere between $10 and $50, depending on a variety of factors, including a student’s age and tutoring plan they choose. Improve Tuition offers online tutoring is the USA for busy mums and Dads. We offer online tutors to fit to your busy schedules and with backing of the smartest brains we can mentor you to succeed.